Rossen Balkanski was born in 1968. In 1995 he was admitted at the State Academy of Music in Sofia in the guitar class of Emil Saev. He is a teacher of guitar at a music school and as a teacher of classical guitar at the State Academy of Music. He has an intensive concert activity, giving solo concerts and concerts together with famous Bulgarian performers such as Professor Yossif Radionov or Professor Angel Stankov. He written numerous works for guitar, some of which have been performed in concert and at competitions in Bulgaria and all over Europe. He composes chamber music for ensembles with guitar and other instruments, as well as arrangements of classical works for the guitar orchestra Orpheus, conducted by Stefan Dimitrov, of which he has been a soloist from the very beginning. He composes songs based on Bulgarian traditional lyrics. From 1991 to 1995 he focused on arrangements and film and theatre music. 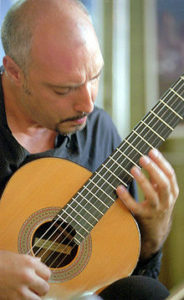 He received the first prize at the Young Guitarist Competition in 1990. In 1992 his Three Miniatures for guitar won him the second prize at the Second Academic Competition, organized by the Academy of Music and Dance Art in Plovdiv and the first prize as a performer at the Third International Competition for guitarists in Plovdiv. The Swiss publishers BIM (1992) published the work Song and Dance for brass sextet. Three Miniatures were published on the pages of the French magazine Cahier de la guitare (1997); his Guitar Sonata was published by the German publishers DAMINUS.